The tagline I’ve seen used to advertise Atomic Blonde just about everywhere states, “the female James Bond has arrived.” To that point, the film succeeds. It’s based on Antony Johnston and Sam Hart's 2012 graphic novel The Coldest City. 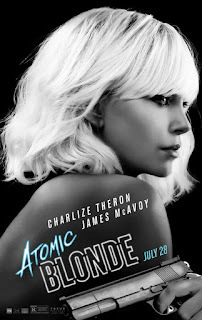 It wisely casts Charlize Theron as the James Bond-esque spy at the center of this twisty, often muddled plot. It takes place in the late 80’s amidst the imminent collapse of the Berlin Wall and mistrust among the world’s superpowers. It begins with the murder of an MI6 agent carrying a microfilm of sensitive information about top-level MI6 agents. The KGB operative responsible for the murder steals the microfilm, but his intentions for the information are less than obvious. In response, MI6 sends field agent Lorraine Broughton to Berlin to investigate the murder, recover the microfilm, and root out a double agent known only as Satchel, who is thought to be in Berlin playing both sides. Lorraine’s contact in Berlin is agent David Percival (James McAvoy), who almost immediately arouses suspicion that he might be the double agent. However, much of the film is devoted to the whodunnit mystery of who Satchel really is and what role he or she may have played in the murder of the MI6 agent and the theft of the microfilm. Much like its obvious inspiration, it features spies with loose allegiances, who may or may not be planting listening devices in order to spy on other spies. It features a Bond-girl of sorts - an attractive, in-over-her-head type who finds herself in danger after getting involved with the main character. It also features characters wearing overcoats, sunglasses, and fancy watches and, of course, the subplot involving the capture of a microfilm. All of that is to say this film is, in a lot of ways, more of a Bond film than even some of the Daniel Craig era Bond films. The visual aesthetic here is also quite striking. The noirish, neon lit cinematography and the 80's synth rock soundtrack - complete with more than one version of the German favorite 99 LuftBalloons - makes for a fun, stylish neo-noir spy thriller. And that cinematography loves to rest on Charlize Theron’s face as she delivers her subtle, but fantastic multi-layered performance. When she isn’t getting into brutal brawls with the bad guys, she’s slipping into an ice bath to keep the swelling down. Despite bearing it all multiple times for the role, the film never comes off as trying to sexualize her. Sofia Boutella plays the naive love interest with much needed vulnerability. However, more interesting than her performance is the way in which she brings out another, softer side of Theron's cool-as-ice Lorraine Broughton. James McAvoy is the only other actor we get to spend a significant amount of time with, and here he has a role he really gets to sink his teeth into. He plays Percival as a wildcard more interested in money, alcohol, and rock and roll than serving his country. That, of course, frequently leads to suspicion about who he really is and what his intentions are. Where Theron is taking the serious lead role here, McAvoy gets to have the most fun in the charming side character role. It's a snappy film that maintains a quick pace and quick cuts its way through many of its scenes. That way even some of its slower moments feel like they're moving quickly. Yet that's what makes the film's best sequence stand out so noticeably. It's a brutal action sequence shot to look like an impressive long take shot on a claustrophobic staircase and a couple of adjacent rooms. She's out numbered and knows it's in her best interest to keep the fighting close quarters to avoid any gunfire that would bring the fight to an abrupt end. It's a credit to the film's choreography and the performers that such an extended long take worked so well. Charlize Theron went through intense training that overlapped with that of Keanu Reeves’ training for John Wick: Chapter 2. The two even sparred together in preparation for these separate roles. It makes sense then, that Atomic Blonde takes a very “John Wick” approach to the fight sequences. Unlike most action movies, you feel the impact of each punch. These fights are dirty, messy affairs that tire every person involved. The action even slows down for little moments where the combatants can wheeze after having their breath knocked out and slowly wobble back to their feet. Weapons are frequently lost, replaced by improvisational weapons. I counted several lamps, tables, chairs and other various household items used as blunt instruments. By the time the fighting was over, I'm sure the owner of the room returned to wonder why a thief came through like a tornado to ransack the place, but left without taking anything. I've never witnessed such a violent fight, thankfully, but I imagine the scene would look something like this by the end. There was blood on the walls, everyone was covered in blood, bumps and bruises. And the victorious one, not heroically daring another wave of enemies to "make their day," but thankful to have barely survived while shaking, barely able to stand. Atomic Blonde is a stylish, occasionally over-the-top spy thriller about a tough-as-nails action heroine, but it approaches it's action with a sense of honesty, and that honesty bears out in brutal fashion. I have no doubt this sequence will go down as one of the best fight sequences shot in the last 10-20 years. However, despite the film’s strong sense of style, spectacular action sequences, and female action star, I’m not sure Atomic Blonde holds together. Don't get me wrong, It’s is an attractively shot, thrilling action movie that is a sure crowd-pleaser, but its twisty plot is hard to follow and full of holes. It creates twists to explain little nitpicks, like Charlize Theron’s very unconvincing British accent, and many of those same twists call into question the events that took place earlier in the film. The twists and turns just don’t quite add up. Even If they did, I'm not sure what they're trying to say. The fact that it’s set against a backdrop of real historical events never seems to matter outside of allowing the filmmakers to indulge in their love of the 80’s aesthetic. While the film clearly wants you to question who is who, who is on what side, and who can be trusted, it never bothers to discern motivation for any of it beyond the baser human inclination toward survival. We never really understand what Lorraine or Percival are doing or why they’re doing it. John Wick and the Daniel Craig era Bond films, as thin as those characters can be, at least gave the character an emotional weakness that provided motivation. That, in turn, provided reason to root for them beyond not wanting to see the main character fail. As for the soundtrack, I'm torn between my love of 80's music and the more practical side of me that recognizes the unimaginative use of the most 80's of 80's songs. It has a few lesser known tracks, but more than once it opts for extremely "on the nose" song choices that had me rolling my eyes. If I gave Suicide Squad flak for its similar overuse of "on the nose" musical choices, I'd be remiss if I didn't mention it here. While in Berlin we get not one, but two uses of “99 Luftballoons,” and while in London, we get the extremely obvious and overused “London Calling.” These are more pet peeves than serious issues, but this unimaginative use of music is becoming too common in today's Hollywood Blockbusters. I’m glad to see more strong lead roles for women in Hollywood. In fact, I’d love to see a series of films devoted to this character, the visual aesthetic, and the brutal action sequences, but with more clear plotting. Atomic Blonde is one of the coolest movies I've seen in some time, but it makes very little sense.